Dig into the best weeknight comfort food! 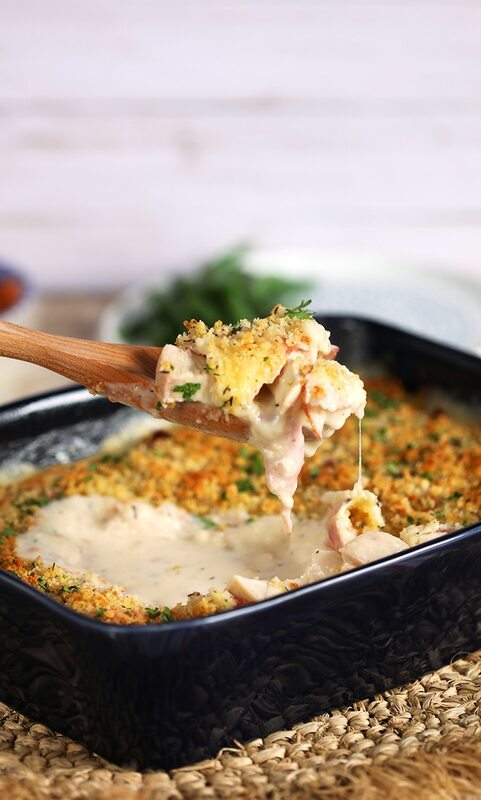 Easy Chicken Cordon Bleu Casserole is creamy, cheesy, buttery and satisfying. 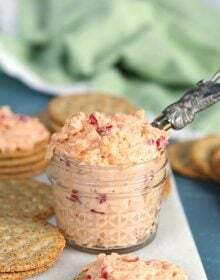 Super simple to make with easy to find ingredients, this one will be on weekly rotation for sure! We made it….it’s Friday! And even if you have a jam packed weekend scheduled, I hope you’re in a part of the country that’s enjoying some of that mild fall weather I’ve been waiting for. I just got back from Iowa where we spanned three different seasons in just three days. It’s pretty crazy…..but the last day was absolutely frigid because the wind was blowing pretty fiercely. It made me want to sit down and stuff my face with some serious comfort food! I’ve been dabbling in casserole recipes again because they were such a staple of my childhood. 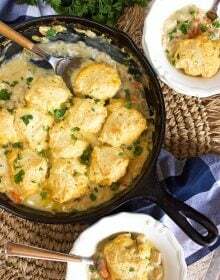 So simple to throw together, the ultimate casserole is a one hit wonder that’s sure to please even the pickiest eater in your family and this Easy Chicken Cordon Bleu Casserole is no exception. 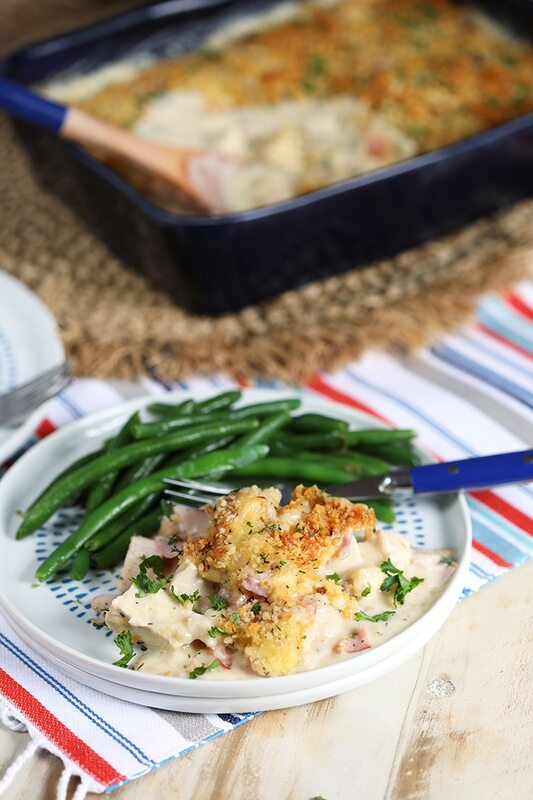 Made easy with fresh, simple ingredients you can pick up at your local grocery store, this Chicken Cordon Bleu Casserole is a twist on the classic Chicken Cordon Bleu recipe. I absolutely love the contrasting textures and flavors of this dish. From the crispy, buttery breadcrumb crust to the tangy, buttery cheese sauce, this dish is quick to throw together for an easy weeknight dinner. Chicken Cordon Bleu is a french classic chicken dish. It’s, basically, chicken breast that’s been butterflied, then stuffed with ham and Swiss cheese. Sometimes the chicken is breaded then fried but I’ve also seen it breaded and baked in the oven. The crispy exterior is a great contrast to the cheesy, salty filling. It’s definitely one of my favorite chicken dinners ever. 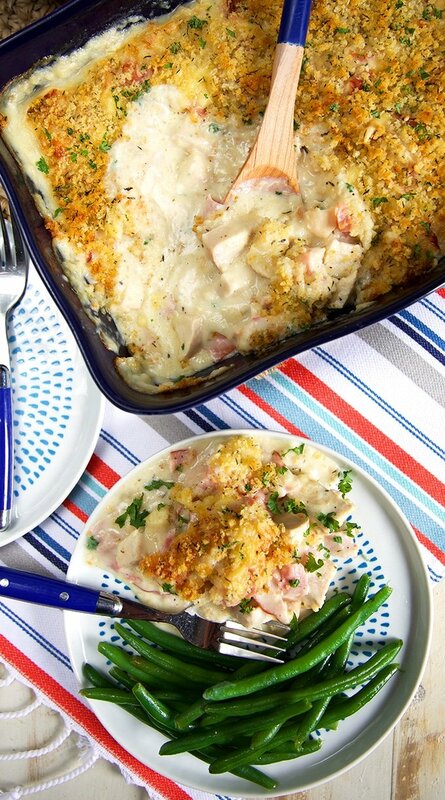 This Baked Chicken Cordon Bleu Casserole is a cinch to make. I like to start with roasted chicken. I’ve seen it made with raw chicken that’s been baked in the Chicken Cordon Bleu sauce but the sauce tends to get watered down and it adds a raw poultry flavor that’s not really my favorite thing at all. This is the perfect way to use up that leftover Sunday roasted chicken or your favorite rotisserie chicken. Place the chicken in the bottom of a 13×9 inch baking dish and set aside. Make the cheese sauce by melting butter in the bottom of a large sauce pan. 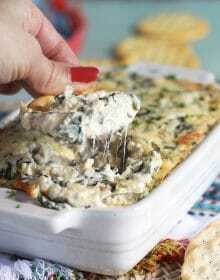 Whisk the flour into the cheese sauce and cook for 1-2 minutes. Add the milk to the flour mixture and whisk to combine. Stir in the garlic powder, salt, pepper and dijon mustard. Continue cooking over medium heat until slightly thickened and sauce coats the back of a spoon. Stir half the shredded cheese into the milk mixture and remove from the heat. 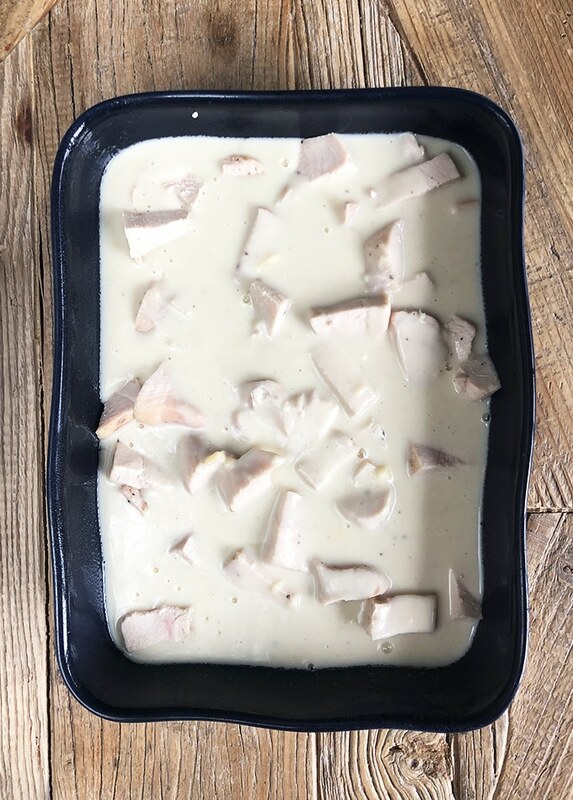 Pour the cheese sauce over the chicken in the baking dish. Top the chicken with the ham and sprinkle with the remaining shredded cheese. In a small bowl, toss together the bread crumbs and butter. Stir in the herbs. Sprinkle the bread crumb mixture over the cheese evenly. Bake the casserole for 30 minutes until golden brown and bubbling. 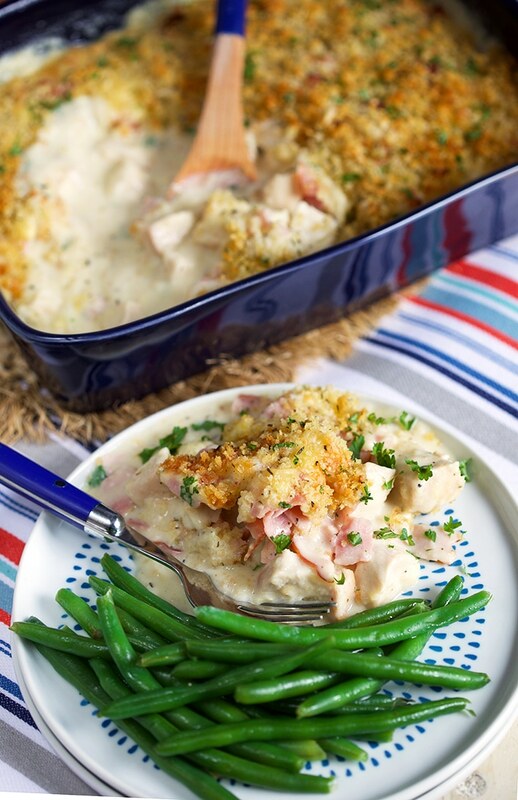 Allow the Chicken Cordon Bleu Casserole to rest for 10 minutes before serving. Can you make Chicken Cordon Bleu Casserole in advance? YES! 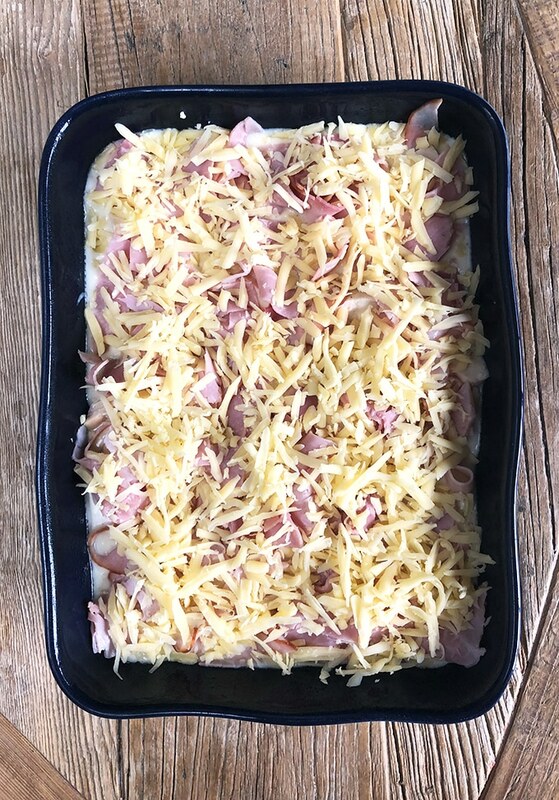 You can make this Chicken Cordon Bleu Casserole recipe in advance and reheat it in the oven when ready to serve. BUT you can also ASSEMBLE the casserole in advance, cover and store in the refrigerator until ready to bake because the chicken is already cooked. I would definitely recommend trying this meal prepping plan to save yourself some weeknight sanity. Just check out the recipe notes for tips on how to do this for best results. Again, YES! Because the chicken is already cooked you can safely freeze the casserole for easy dinners at another time. It’s also fabulous for Pot Lucks. 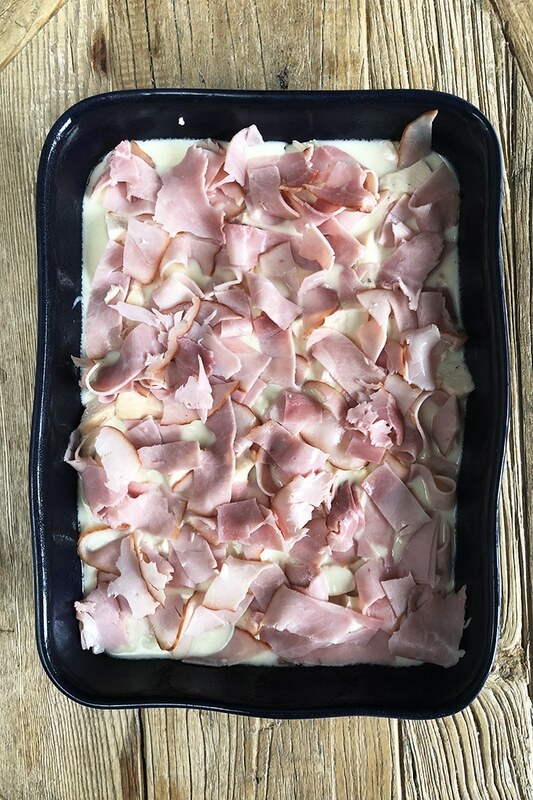 Assemble the Chicken Cordon Bleu Casserole up to the ham topping. Once cooled, top the casserole with the cheese and bread crumb topping. Cover the casserole tightly with plastic wrap and then cover with foil. Label the casserole with the name of the dish “Chicken Cordon Bleu Casserole” and cooking instructions, as well as, the date you froze it. Remove the foil and plastic wrap from the casserole. Bake the casserole for 1 hour or until golden brown and bubbling. I like to serve Chicken Cordon Bleu Casserole with a side of green beans or a light green salad like this classic wedge. 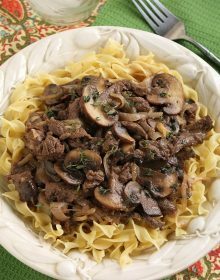 Either option makes for a hearty and comforting week night dinner. And if you’re looking for EVEN MORE family friendly recipes be sure to follow us over on Instagram! 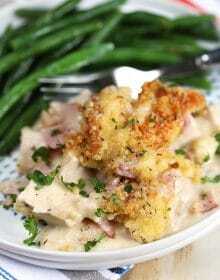 Super easy to make Chicken Cordon Bleu Casserole is a weeknight life saver. 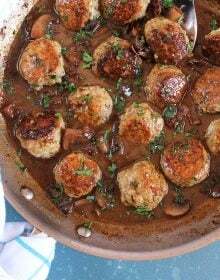 Make ahead and freezer tips will have this dinner on your table in a flash. 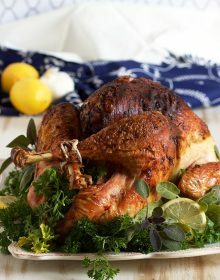 Spread the chicken in an even layer in a 13x9 inch baking dish coated with cooking spray. Set aside. In a medium saucepan over medium heat, melt 4 tablespoons of butter. Whisk in the wine and cook for 1-2 minutes. Whisk the flour into the butter mixture and cook for an additional 2 minutes until the mixture begins to turn golden. Slowly whisk in the milk continuing to cook until the mixture is slightly thickened. Stir in the garlic powder, mustard and cheese. Remove from the heat and continue stirring until smooth. Stir in the salt and pepper, to taste. Pour the cheese sauce over the chicken. Arrange the ham over the chicken and sprinkle with the remaining Swiss cheese. Set aside. Melt the remaining butter in the microwave for 20 seconds. Stir the bread crumbs and thyme into the butter to combine. Sprinkle the bread crumb mixture over the casserole and transfer to the oven. Bake the casserole for 30-40 minutes or until golden brown and bubbling. Allow the casserole to rest for 10 minutes prior to serving. To make this recipe gluten free, replace the flour with cornstarch and use a gluten free alternative bread crumb mixture. To assemble the casserole in advance and bake later, assemble the whole casserole and skip the bread crumbs. Add the bread crumb mixture immediately prior to baking when ready. 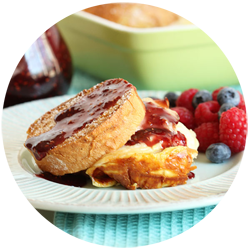 Comfort food made simple-like the ultimate comfort! 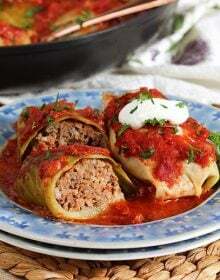 This is a delicious dish that I make for my family and they love it! Love a great casserole this time of year. The chicken, ham and cheese should make everyone in the family happy – we’ll find out this weekend! 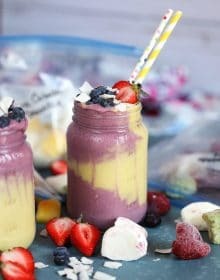 Love how easy this is to make! 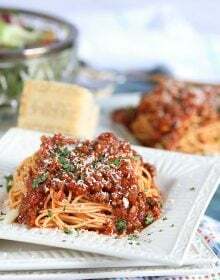 This is a comfort food dinner everyone will love! Just so hardy! Perfect for cooler days.